You are here: Home / Bulletin Boards and Displays / Have Fun With I Love to Read Month! 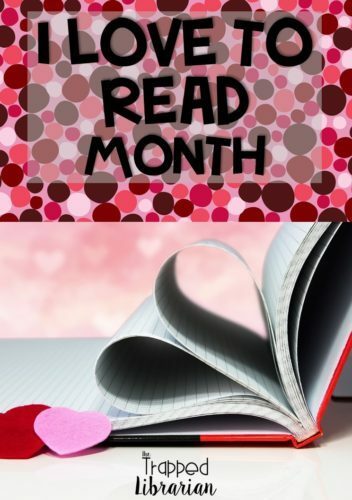 February is “I Love to Read Month!” It’s the perfect time for you to celebrate reading in your school! 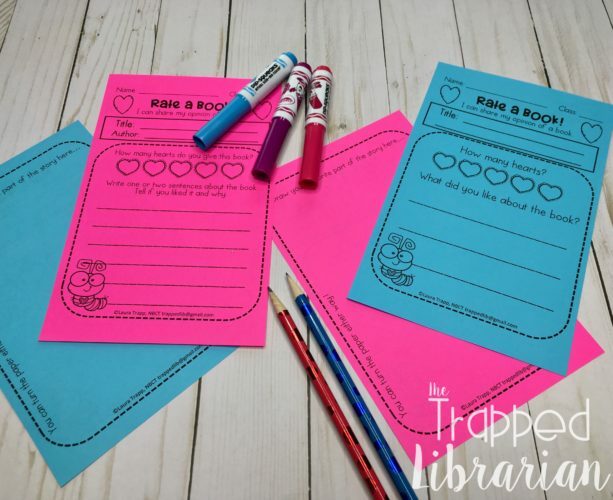 Start with an “I Love to Read” bulletin board and a book recommendation center and you will help your students and staff spread the love of reading throughout the school. 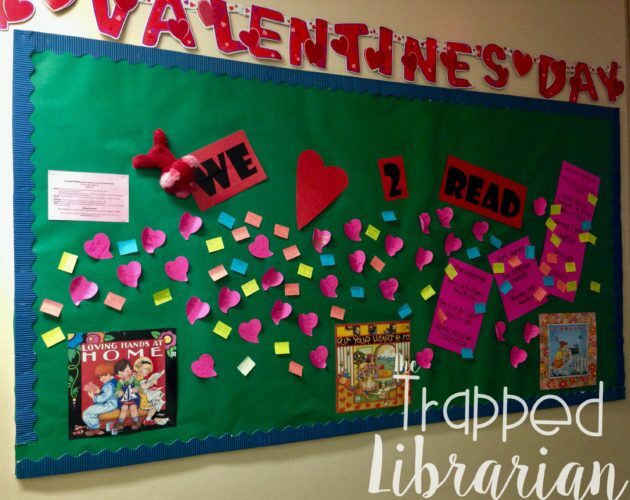 Display a “WE LOVE TO READ” bulletin board in a prominent place in your school. My library is in the middle of 10 classrooms and I have large bulletin boards in the hallways leading into the library. This is a great place for a bright interactive display. Put some colorful sticky notes and/or some book recommendation slips in a center and ask students to recommend a book they love to read. It can be something they have read recently or a book they’ve read before – maybe an old favorite! Students can put their sticky notes on the bulletin board. 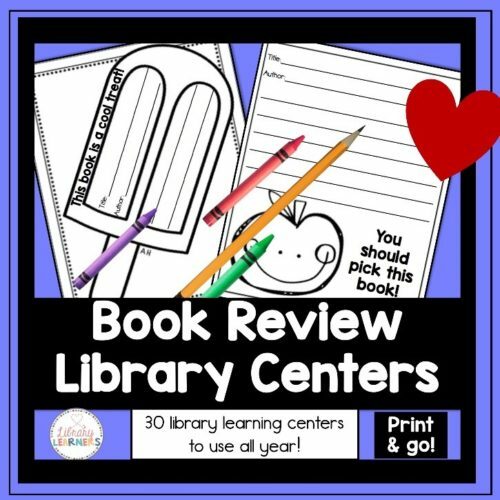 I’ve got a FREE “Rate a Book” resource for you to use in your “I Love to Read” book recommendation center – grab it here! 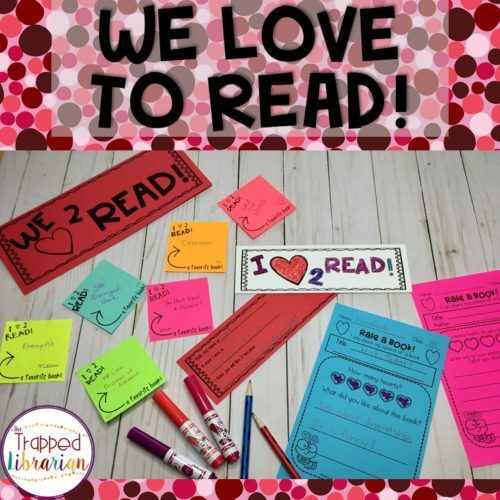 I like to do a bookmark exchange in February as part of I Love to Read Month and have my students create bookmarks that recommend a favorite book to someone in another school. They could also teach someone else about a topic they have been recently researching or just decorate a fun bookmark for the exchange. To do a bookmark exchange in your school, just have students in each class create a bookmark and exchange them with another class. I have had classes exchange bookmarks with classes in other schools in my district and it is always fun to make a connection with someone new. 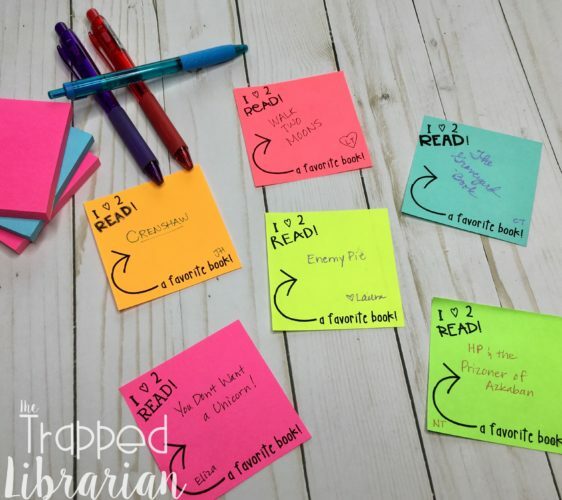 I love to exchange bookmarks with classes in other cities and states, so if you’re interested in exchanging with us, please send me an email at trappedlib@gmail.com ! 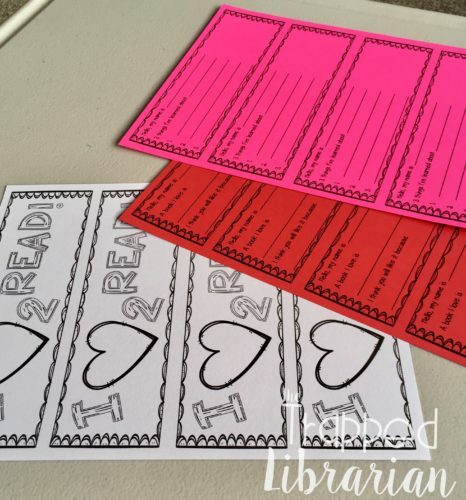 Make an “I Love to Read” sign and display seasonal books in a special area of the library. You can also include books that staff and students have rated, reviewed, and recommended in the book recommendation center. 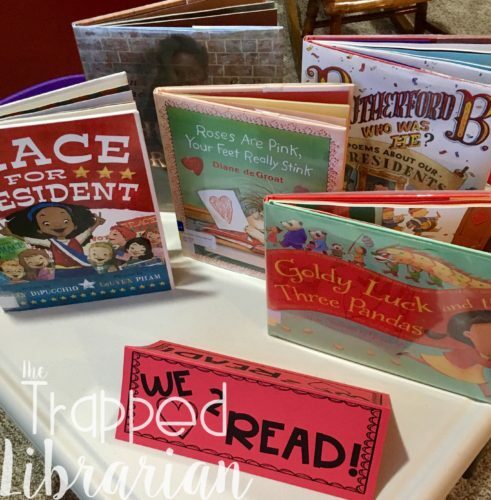 Speaking of February books, I’ve got some recommendations for some picture book read alouds along with some free resources at this post! 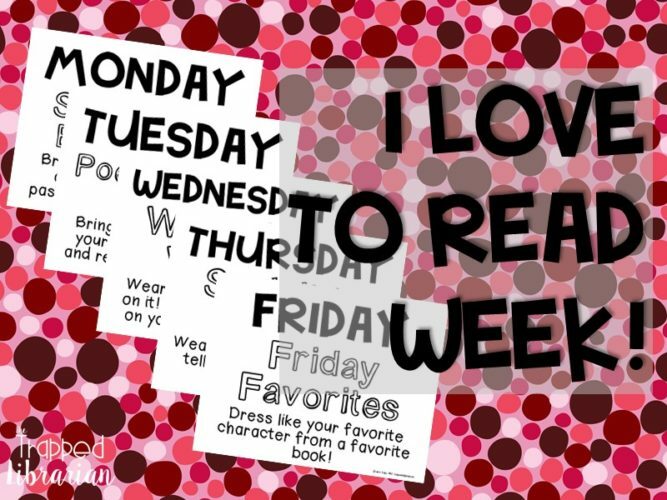 It’s super fun to celebrate a WEEK dedicated to the love of reading during the month of February! If you have your book fair in February, that is a great week to celebrate, but any week will do! Choose a fun theme for each day to get everyone to play along. 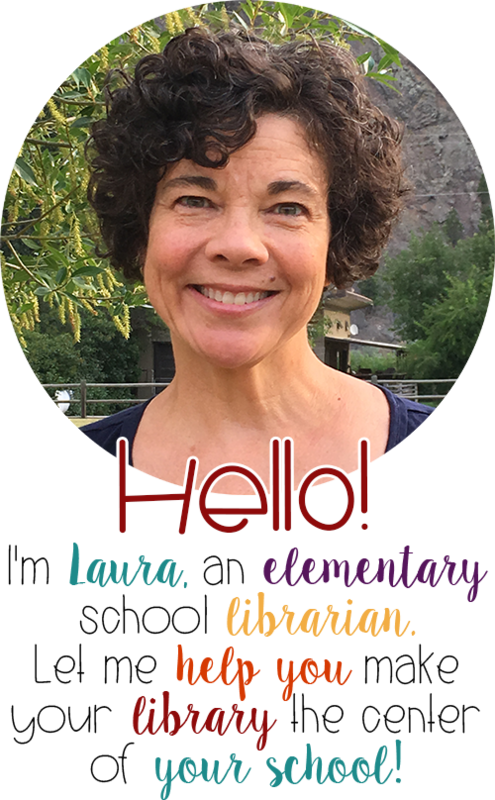 In my school we’ve done “Crazy Sock Day,” “Poem in Your Pocket Day,” “Wearable Words Day,” “Dress Like a Book Character Day,” and “Book Selfie Day.” You can choose anything that sounds fun and festive and that shares a love for books, and you can bet your school community will jump on board! An estimation jar is always a fun activity in the library. 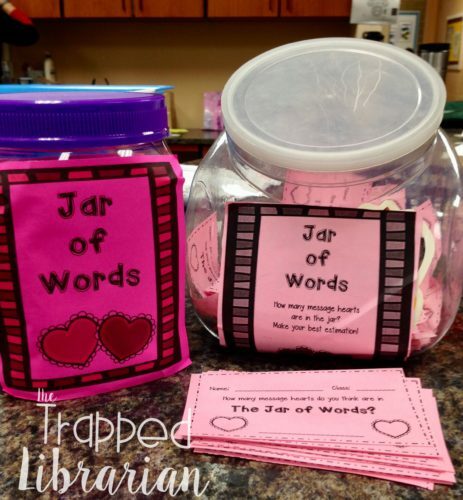 For “I Love to Read Month” in the library, or Valentine’s Day in the classroom, you can make a quick JAR OF WORDS. In the library, I always give the jar as part of the prize, along with a free book. I usually recycle a jar from Costco – soak it to get off the labels and clean it really well! Get some candy hearts and you’re ready. If you want to try an estimation jar this year, grab this FREE Jar of Words resource. Just add your own jar and some conversation hearts and you’re ready for some fun! 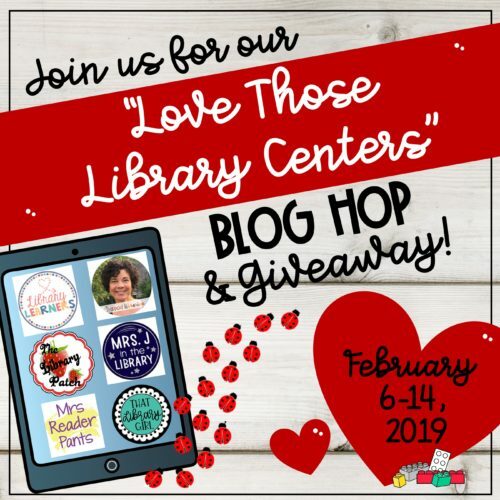 Now it’s time to hop on over to the Library Learners blog where my friend Cari is featuring a multi-pack of book review library centers that will cover you throughout the school year! 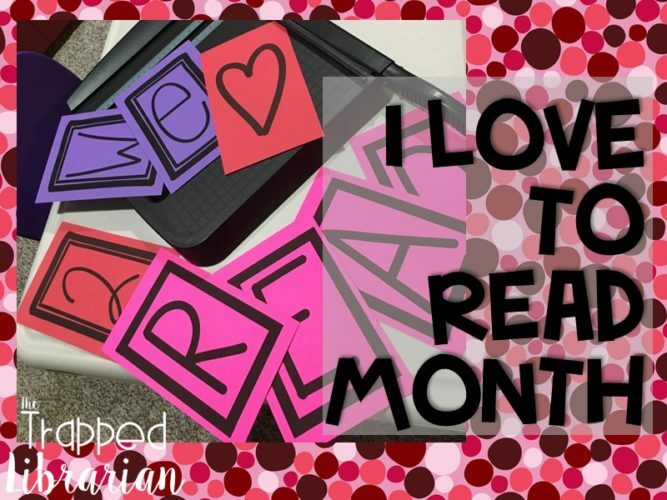 What plans do you have to celebrate “I Love to Read Month” in your school? Share your great ideas with us here!